Sakai Community DocumentationSakai 19 User Guide (English) GradebookHow does extra credit work in Gradebook? Select an item's drop-down menu. 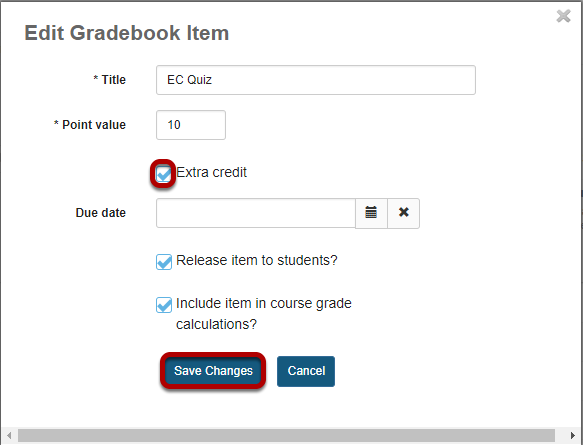 Tip: The extra credit option may also be set when adding a new gradebook item. An extra credit item will display a plus (+) icon in the column header to indicate that it is an extra credit item. Example scenario: In a gradebook that contains three quizzes worth 10 points each, where two of the quizzes are for credit and one quiz is for extra credit, the total points possible for all quizzes is 20 (i.e., 2 quizzes worth 10 points each). A student who scores 10/10 points on all three quizzes will earn a course grade of 30/20 points, or 150%: 10 points for the extra credit quiz are added on top of the total points of the other items. A student who scores 10/10 points on only two of the quizzes (i.e., skipping any one of the quiz items) will earn an overall grade of 20/20, or 100%. An extra credit quiz can make up for a missed quiz when the extra credit item is worth the same point value. In a weighted category, extra credit items are averaged together with the other items before the category average is weighted. Example scenario: In an Assignments category worth 40% of the course grade, there are 3 regular assignments and 1 extra credit assignment, each worth 10 points. The points for all four items are added together (e.g., 40 points), then divided by the total points possible (30). If a student receives perfect scores on every assignment, their category average is 133.33%. The category average is weighted as 40% of the course grade, so the weighted category average is 53.3% of the course grade. 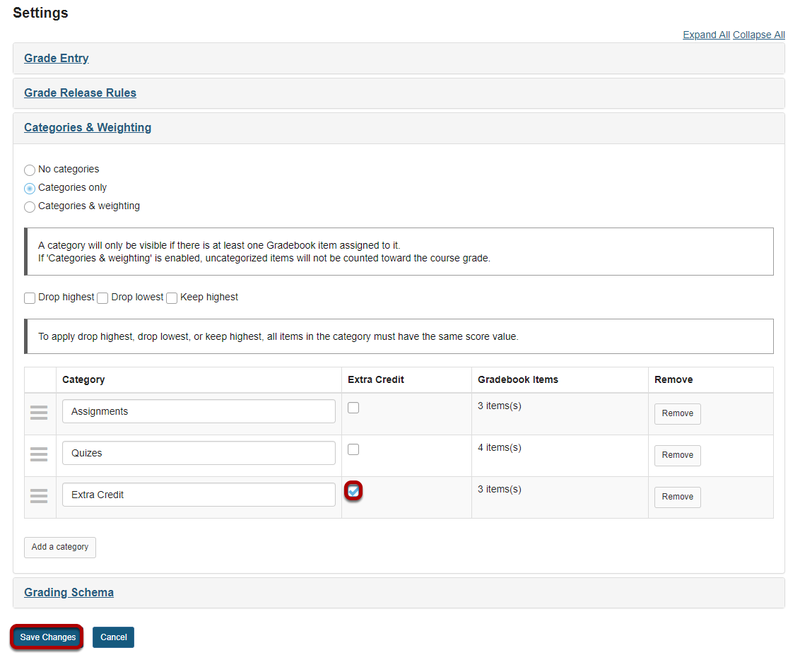 Sample extra credit category scenario: The Gradebook is configured with Categories only (no weighting). One category is designated as extra credit. Three items worth 10 points each are assigned to the category. In this scenario, a student who earns a perfect score for all gradebook items, including 10/10 points for all three items in the extra credit category, will receive 130/100 points possible, or 130%. Sample extra credit weighted category scenario: When you set Categories and weighting in a gradebook, the total relative weight of all categories must be 100%. However, if one category is designated as extra credit, you can have a combined category sum greater than 100%. In this example, three regular categories are used and weighted as follows: Assignments (40%) + Discussions (10%) + Quizzes (50%) = 100% of the course grade. An extra credit category is worth 5% of the course grade. A student who completes all work in the extra credit category could potentially earn 105% for their course grade.